The Prohibition: Al-Tirmidhi #580, Narrated AbudDarda' ...don't drink wine for it is the key to every evil. Abu Dawood, Narrated Umar ibn al-Khattab "When the prohibition of wine (was yet to be) declared, Umar said: O Allah, give us a satisfactory explanation about wine. So the following verse of Surat al-Baqarah revealed; "They ask thee concerning wine and gambling. Say: In them is great sin...." Umar was then called and it was recited to him. He said: O Allah, give us a satisfactory explanation about wine. Then the following verse of Surat an-Nisa' was revealed: "O ye who believe! approach not prayers with a mind befogged...." Thereafter the herald of the Apostle of Allah would call when the (congregational) prayer was performed: Beware, one who is drunk should not come to prayer. Umar was again called and it was recited to him. He said: O Allah, give us a satisfactory explanation about wine. This verse was revealed: "Will ye not then abstain?" Umar said: We abstained. 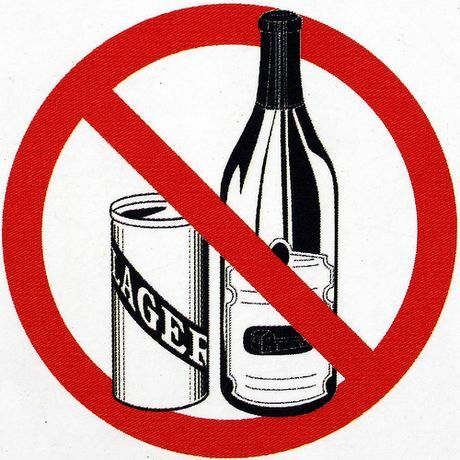 The Noble Qur'an - al-Baqarah 2:219 They ask you (O Muhammad ) concerning alcoholic drink and gambling. Say: "In them is a great sin, and (some) benefit for men, but the sin of them is greater than their benefit." And they ask you what they ought to spend. Say: "That which is beyond your needs." Thus Allâh makes clear to you His Laws in order that you may give thought. Selling and Buying: Al-Tirmidhi #2776 Narrated Anas ibn Malik "Allah's Messenger cursed ten people in connection with wine: the wine-presser, the one who has it pressed, the one who drinks it, the one who conveys it, the one to whom it is conveyed, the one who serves it, the one who sells it, the one who benefits from the price paid for it, the one who buys it, and the one for whom it is bought." Tirmidhi and Ibn Majah transmitted it. Dying when Addicted: Muslim #4963, Narrated Abdullah ibn Umar "Allah's Messenger said: Every intoxicant is Khamr and every intoxicant is forbidden. He who drinks wine in this world and dies while he is addicted to it, not having repented, will not be given a drink in the Hereafter." Beat for Drunkedness: Bukhari 3:509, Narrated 'Uqba bin Al-Harith "When An-Nuaman or his son was brought in a state of drunkenness, Allah's Apostle ordered all those who were present in the house to beat him. I was one of those who beat him. We beat him with shoes and palm-leaf stalks." Bukhari 8:764, Narrated Anas bin Malik "The Prophet beat a drunk with palm-leaf stalks and shoes. And Abu Bakr gave (such a sinner) forty lashes." Bukhari 8:768, Narrated Abu Salama Abu Huraira said, "A man who drank wine was brought to the Prophet . The Prophet said, 'Beat him!' " Abu Huraira added, "So some of us beat him with our hands, and some with their shoes, and some with their garments (by twisting it) like a lash, and then when we finished, someone said to him, 'May Allah disgrace you!' On that the Prophet said, 'Do not say so, for you are helping Satan to overpower him.' " Satan's Use of Intoxicants The Noble Qur'an - Al-Ma'idah 5:91 Shaytan (Satan) wants only to excite enmity and hatred between you with intoxicants (alcoholic drinks) and gambling, and hinder you from the remembrance of Allah and from As-Salât (the prayer). So, will you not then abstain?" Medicine: Abu Dawood, narrated Tariq ibn Suwayd or Suwayd ibn Tariq Wa'il said: "Tariq ibn Suwayd or Suwayd ibn Tariq asked the Prophet about wine, but he forbade it. He again asked him, but he forbade him. He said to him: Prophet of Allah, it is a medicine. The Prophet said: No it is a disease." Abu Dawood; Sahih Bukhari Abu ad-Darda reported that the Prophet said: "Allah has sent down both the malady and its remedy.. For every disease He has created a cure. So seek medical treatment, but never with something the use of which Allah has prohibited." If your husband (or other relative) comes home drunk (please note that you have grounds for divorce in such an example), ask for the Muslim brothers to give him 40 lashes for it. Don't be a passive tool of Shaitan by accepting alcoholism in your family or the Muslim community.